This is the third consecutive vintage of the Seven Directions Pinot Noir Rosé that I have reviewed. Looking back on the notes for the 2012 and 2013, I am struck by the impressive consistency of the wines. Each of those was scored 91 points. Guess what the score is for the 2014! It might be hard to find an Okanagan winemaker more passionate for rosé than Daniel Bontorin, a consulting winemaker whose clients include Volcanic Hills Estate Winery. His own label, Seven Directions, produces only rosé. Daniel’s rosé-making pedigree goes back to the 2005 vintage when he made Vaïla, the outstanding rosé still produced at Le Vieux Pin. That wine, along with rosé from JoieFarm Winery, probably started the renewed interest in a wine style made now by the majority of wineries. For his own rosé, Daniel likes Pinot Noir, choosing the organic Pinot Noir grown by Kalala Vineyard. “The 2007 Vaïla was from the Kalala Vineyard, so I knew the quality of the fruit,” he says. Here is a note on the current release. Seven Directions Pinot Noir Rosé 2014 ($24.26 plus tax for 130 cases). The wine presents itself with a dark Sockeye salmon hue. It has aromas of cherries, strawberries and apples. On the palate, there are flavours of strawberry and grapefruit. Fermentation and four months aging in French oak has contributed good structure. The wine has a crisp, dry finish. 91. C.C. Jentsch Cellars opened its winery just two years ago in a converted apple processing plant beside the highway south of Oliver. Even though the tasting room is quite visible and even though the wines are widely available, I still encounter consumers who have never heard of the winery. That may change as a result of a recent tasting called The Judgment of BC. C.C. Jentsch Syrah 2013 emerged as the number one red wine in a field of 12 superb British Columbia and international Syrahs. Take a bow, winegrower Chris Jentsch and Amber Pratt (right), Chris’s winemaker. The Judgment of BC was a tasting that pitted six Chardonnays and six Syrahs from British Columbia against a similar number of Chardonnays and Syrahs from international wine regions. The wines were tasted blind and scored by a panel of 17 tasters, including British wine authority, Steven Spurrier. 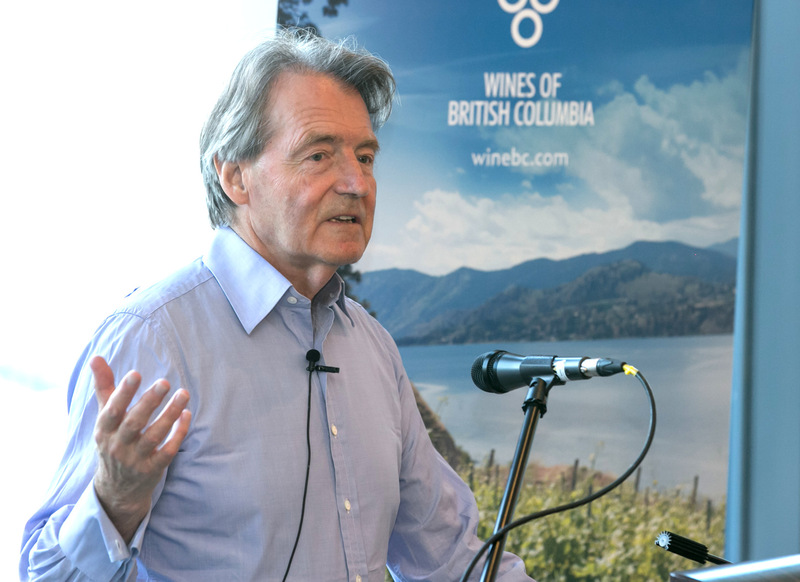 The tasting, organized by the British Columbia Wine Institute, was modelled on Spurrier’s famous 1976 tasting, The Judgment of Paris, which put California wines in the map internationally. The results of The Judgment of BC are unlikely to have the same shock value, for three reasons. British Columbia wines did not score a clean sweep; British Columbia does not have the market weight of California; and comparative tastings like this have become routine. You can understand why the French were outraged when an upstart like Stag’s Leap Cabernet Sauvignon beats a First Growth Bordeaux like Chateau Mouton. The result launched California wines onto the world stage. Having said that, there is always an asterisk about wine judgings. In the Wikipedia entry of The Judgment of Paris, Spurrier (left) is quoted as saying: "The results of a blind tasting cannot be predicted and will not even be reproduced the next day by the same panel tasting the same wines." Some judges are more consistent than others; others have good days and bad days. While there were no wines of First Growth status up against the British Columbia wines, the competition was stiff. Of the 12 Chardonnays, those ranking one through five all were from international wineries. Of the 12 Syrahs, British Columbia wines took places throughout the field, including number one. My view is that British Columbia wines are now running with the pack. We can stop asking ourselves if we are world class yet. We most certainly are. Even a two-year-old winery like C.C. Jentsch can play with the big boys. Here is how the wines were ranked. Setting a high bar is always a good idea when opening a new winery. The bar was set for Giant Head’s owners, John Glavina and Jinny Lee, during a 1998 Burgundy vacation when they enjoyed several bottles of Gevrey-Chambertin from the premier cru appellation of Le Clos Saint-Jacques. Their Summerland winery opened this summer with a Gewürztraminer and two sparkling wines. In barrel are two solid reds, a Merlot and a Pinot Noir. It is up to someone more expert in Burgundies that I am to decide how close that Pinot Noir is to Gevrey-Chambertin. Let me just say the wine is delicious and, when released, will be nowhere near as expensive as a premier cru Burgundy. John was born in Montreal in 1960. His father, an immigrant from Malta, was a computer technician with Honeywell. His job involved transfers around Canada. The family ended up in Vancouver where John in 1985 earned a Simon Fraser University degree in computer science, with a minor in business. He started his career with IBM, then spent two years with CGI Group before launching his own information technology consultancy. During the ten years that he ran that, he spent five years in Portland, Oregon. The affection he and Jinny developed for Pinot Noir flourished with tours of Willamette Valley wineries. “About that time, I got quite interested in wine,” he says. Finally in 2002, the couple and their two children moved to the Okanagan and bought an apple orchard near Summerland. The trees soon were removed to make way for four acres of high-density plantings. The couple built their own greenhouse to propagate the cuttings obtained from various select Okanagan vineyards. They grow Pinot Noir, Merlot, Gewürztraminer and – for blending with the latter – about 100 vines of Riesling. Both took viticulture courses but John leaves much of the viticulture in her hands. They began selling grapes when their vineyard came into production. However, during the winery’s long dress rehearsal, John began making Pinot Noir and Merlot for personal consumption in 2008. “It is hard to live in a vineyard and not make wine,” he says. Wines from five vintages now rest in his private cellar. Winery regulations do not permit him to sell those wines. Giant Head Blanc de Noir 2014 ($32). This is a dry sparkling wine from Pinot Noir grapes. It has a pale hue and active bubbles. The flavours are of green apples and citrus. The finish is crisp and refreshing. 90. Giant Head Merlot Rosé 2014 ($26). This frizzanté wine evokes memories of summer picnics. Dark in hue, it is packed with flavours of cherry and raspberry. The generous texture gives it nice weight on the palate. The finish is dry. 89. Giant Head Gewürztraminer 2014 ($24). The 15% Riesling in this blend assure that the wine has bright acidity to complement the aromas and flavours of guava, pear and lychee. The finish is dry. 88. 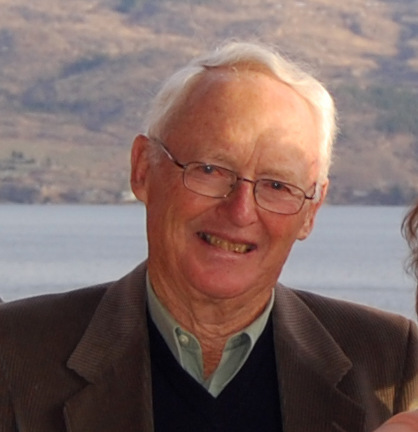 One of the earliest blocks of Pinot Noir in Canada was planted in 1975 by Richard Stewart, now the elder statesman of the family that owns Quails’ Gate Estate Winery. It was a prescient choice. Quails’ Gate has become one of British Columbia’s best producers of Pinot Noir. It was one of 26 wineries at this year’s B.C. Pinot Noir Celebration. The three Pinot Noirs at its table included the 2012 Richard’s Block Pinot Noir, a wine released last year to honour his pioneering viticulture. It would not have been made from those 1975 plantings. The Davis 1 Clone that he planted has since been replaced by better Dijon clones. Quails’ Gate grows seven or eight clones. The oldest plantings now date from 1987. The majority of its Pinot Noir plantings were put in between 2003 and 2005, as the winery set out to make this variety its flagship. In his 2004 book, North American Pinot Noir, John Winthrop Haeger (an American writer) included five pages out of 445 on British Columbia. It indicates how far British Columbia Pinot Noir was off the radar when he was researching the book fifteen years ago. Quails’ Gate and Blue Mountain Vineyard & Cellars deserve most of the credit for proving that great Pinot Noir can be made in the Okanagan. Another quote from Haeger’s book, which had a skeptical edge to it, shows where Pinot Noir production was 10 years ago. The only British Columbia winery to get a full profile in Haeger’s excellent book was Blue Mountain Vineyard and Cellars. It is too bad that he has not been back to the Okanagan (to the best of my knowledge) to discover how many wineries have become serious about Pinot Noir, including Mission Hill. The winery’s Martin’s Lane Pinot Noir 2011 won a major award two years ago at a London wine competition. The rich and full-bodied 2013 vintage of that wine was, in my opinion, one of the best at the Pinot Noir celebration. And Mission Hill has built a Martin’s Lane Winery and further consolidated is commitment to Pinot Noir by purchasing CedarCreek Estate winery two years ago. Like Mission Hill, numerous wineries have climbed onto the Pinot Noir bandwagon. The acreage of Pinot Noir has doubled in the last decade, as is shown by the industry’s periodical vineyard censuses. The suggestion that the variety is a heart-break grape comes from the title of a 1994 book by Marq De Villiers, about a California winemaker named Josh Jensen. As that indicates, the title of the book had more to do with Jensen’s personal life than with the viticultural challenge of Pinot Noir. The variety performs quite well in most British Columbia terroirs and is no more challenging to winemakers than most varieties. The other bit of recent Pinot Noir literature (I use the term loosely) was Rex Pickett’s 2004 book, Sideways: A Novel, which was turned into a popular movie shortly after. The story involved two characters in California who guzzled great Pinot Noir and bedded accessble women. I disliked the book so much that I skipped the movie, which was much better, according to reviews. The movie had a spectacular impact on Pinot Noir sales. Tony Stewart, the president of Quails’ Gate, told me that, before the movie, he had trouble convincing restaurants to offer Pinot Noir by the glass. After the movie, the wine shot out of the door. That seemed to coincide with a planting spree by Quails’ Gate and other wineries. British Columbia Pinot Noir has been on a roll ever since. The first Pinot Noir Celebration two years ago was small enough to be accommodated at Meyer Family Vineyards at Okanagan Falls. The winery’s owner, JAK Meyer, is one of the forceful promoters behind staging these events. His winery has become a leading Pinot Noir producer. Last year, so many wineries applied to be at the event that they were chosen by a lottery. This year, when even more applied, a tasting panel of sommeliers screened the wines. Some excellent producers didn’t make the cut, which may have more to say about the judging than the wine quality. This year’s format allotted just two hours to taste the wines, which was totally inadequate. At least three hours, if not four, should be available. I managed to taste just 26 wines, less than half of what was on offer. I never got to the tables of such notables as Blue Mountain, 50th Parallel and Tantalus Vineyards. But what marvellous wines! All but two that I tasted scored 90 points or more. The styles vary considerably but, in general, all showed classic aromas and flavours that ranged from strawberry to cherry to spicy plum. Some were light; some were full-bodied. Almost all had the silky texture of good Pinot Noir. Pinot Noir is among the most versatile of red wines. The sensuous character of the aromas, flavours and texture means that it can be enjoyed on its own more easily than bigger reds. As a food wine, it pairs especially well with salmon. My absolute favourite food pairing is a simple mushroom risotto. I already noted the impressive Mission Hill Martin’s Lane Reserve 2013. Others that were particular standouts included Privato 2012 Pinot Noir; LaFrenz Pinot Noir Reserve 2013; Meyer Mclean Creek 2013; Quails’ Gate Stewart Family Reserve 2012; Road 13 Castle Vineyard 2012; and Stoneboat 2012. By sheer coincidence, two wineries – one an old favourite, one I had not hear of – each sent a pair of white wines from the 2014 vintage. So I take the liberty of reviewing them together, if only to accelerate the pace of publishing reviews. Two by two, as they say of Noah's Ark. The familiar winery is Blue Mountain Vineyard & Cellars, which has been producing interesting wines from its Okanagan Falls vineyard since 1991. Recently, I was suggesting to a friend that he send a California house guest and Pinot Noir fancier to Blue Mountain. He was unaware that the winery has had a public tasting room for two years now. It shows how long it takes the word to get out. Blue Mountain has always accepted visitors who had the foresight to make appointments. Those without appointments sometimes were turned away. Blue Mountain got the reputation of being an unfriendly winery. That was not deserved: the owners were not hostile to people; they just were far too busy to drop things whenever an unexpected car pulled into the driveway. With additional family members now in the business, the winery’s tasting room is as friendly as any other in the Okanagan. The winery I had not heard of is Fern Walk Vintners. The label says it is in Kelowna but don’t drive around the city in search of it. It is one of that stable of labels under Mark Anthony Fine Wine Merchants. You will have heard of the major label in the group: Mission Hill Family Estate Winery. The place to find the Fern Walk wines is in the Liquor Distribution Branch and probably in the various Mark Anthony wine stores. There are at least 29 labels under the Mark Anthony umbrella, including such strange labels as Kindle, Screw It and Yolo. I presume it makes business sense to someone. Fern Walk is a label no one would be embarrassed to have on the table. In fact, the packaging is quite elegant. You would expect these to be $30 wines and you will be happy to know they are not. Here are my notes on the four wines. Blue Mountain Sauvignon Blanc 2014 ($19). This is Blue Mountain’s fourth of fifth vintage of this varietal and, in my view, the best so far. It begins with aromas of herbs, fresh grass and lime. On the generous palate, there are flavours of lime and lemma with a defining spine of minerality. The wine has a crisp, vibrant finish. 91. Blue Mountain Pinot Blanc 2014 ($18). Few wineries take Pinot Blanc as seriously as Blue Mountain. The wine is made from 29-year-old vines and shows the depth of flavour minerality that comes with old vines. Forty percent of the wine was fermented in neutral French oak; the rest in stainless steel. The wine has aromas and flavours of apples, peaches and apricots. It is crisply dry on the finish. 91. Fern Walk Pinot Gris 2014 ($16.99). No oak is used here; this is all about freshness and crispness. There are aromas and flavours of pears, apples and citrus, with just a hint of bready lees. The golden colour obviously results from a little skin contact which picked up flavour but also very slight hint of bitterness on the finish. 87. Fern Walk Sauvignon Blanc 2014 ($16.99). Aged seven months in stainless steel, this is a crisp and refreshing wine with aromas of herbs mingled with grapefruit. On the lively palate, there are flavours of lime and kiwi. 89. In the summer of 2014, Andrew Windsor joined Tinhorn Creek Vineyards as winemaker. He took over from Sandra Oldfield, who had been winemaker since 1994 until her promotion last year to become the winery’s president. The recent releases from Tinhorn Creek provide a very encouraging glimpse of Andrew’s talents. The three whites from 2014 are impressive. One waits with anticipation for the release of the 2014 reds. Lest one gets carried away, it is worth noting that Korol Kuklo, who was Sandra’s assistant winemaker, remains in that position. She would have been involved in the wines as well, although the specification sheets for the 2014 wines all credit Andrew as winemaker. His background was well laid out in the press release the winery issued in April 2014 when his hiring was announced. Ontario-born Andrew’s first taste of wine was a friend’s parents’ attempt at homemade wine but it didn’t put him off and he went on to take a course in wine whilst studying Environmental Science at the University of Guelph. In his twenties Andrew met Jamie McFarland of The Ice House Winery, who invited him to assist with his ice wine project in Niagara-on-the-Lake. Andrew had a sharp taste of the winemaking world when he was called to start picking grapes at 3 am in minus 12C weather. Heading to warmer climes, Andrew gained a Masters of Oenology at the University of Adelaide in Australia in 2006 and then took on an Assistant Winemaking role at Mollydooker Wines in McLaren Vale, where he lived on the beach and cycled to work through vineyards filled with kangaroos. Working closely with Viticulturist, Andrew Moon and Assistant Winemaker, Korol Kuklo, Andrew will be overseeing the winemaking process from vines to bottle. He brings with him a wealth of experience, having worked in wineries in the Okanagan, Marlborough in New Zealand and the Northern Rhone in France before returning to Canada to work as VQA Winemaker for Andrew Peller Ltd. in Niagara. The press release omitted that Andrew already had some winemaking experience in this region. He spent 10 months at EauVivre Winery & Vineyard, starting in July 2010, before taking a job in New Zealand. For a winemaker in his mid-30s, he has tons of experience. He may be heading into his best, but also his toughest, vintage in 2015. The forest fires that broke out last week in the Oliver area (Tinhorn Creek’s property was spared) have covered the vineyards with smoke. The risk is that the grapes, which are ripening unusually early, will pick up smoke taint. One only hopes that the smoke is not too thick and not too persistent. Here are notes on Tinhorn Creek’s current releases. Tinhorn Creek Oldfield Series 2Bench White 2014 ($19.99 for 1,600 cases). This complex blend is 30% Sémillon, 25% Chardonnay, 23% Sauvignon Blanc, 12% Viognier and 10% Muscat. Portions of the wine were barrel-fermented with wild yeast. The wine appeals immediately with aromas of hazelnut, tangerine and toasted oak. The wine is rich and satisfying on the palate, with flavours of tangerine, guava and ripe apple. The elusive hint of hazelnut returns on a finish that goes on and on. 92. Tinhorn Creek Chardonnay 2014 ($16.99 for 1,900 cases). This wine appears to be partially barrel-fermented. The oak is so well integrated that it is barely perceptible. The texture is generous and the flavours are mouth-filling. The wine begins with lovely aromas of citrus and apple, leading to tropical fruit flavours and a crisp, refreshing finish. 90. Tinhorn Creek Gewürztraminer 2014 ($14.99 for 4,800 cases). This is a gold medal winner in national wine awards, deservedly so. It has aromas of spice and lychee. On the palate, there is a medley from fruit flavours, including lychee, peach and grapefruit. The hint of residual sugar, very well balanced with moderate acidity, gives the wine a rich texture. The finish just goes on and on. This is one of Tinhorn Creek’s finest Gewürztraminers. 91. Tinhorn Creek Merlot 2013 ($17.49 for 9,136 cases). This wine won a bronze medal at the San Francisco International Wine Competition. Frankly, with its 17-year-old vines and good viticulture, Tinhorn Creek could do better. This is an easy-drinking, medium-bodied wine with aromas of cherry and oak, flavours of red fruit and soft, ripe tannins. I liked the wine but would have liked it better if the fruit were more concentrated. 88. Tinhorn Creek Oldfield Series Syrah 2012 ($30.49 for 180 cases). This gold medal winner is available only to members of Tinhorn Creek’s wine club. What they are getting is a big, solid wine with meaty aromas mingled with red fruit. On the palate, there are flavours of cherry, blackberry and vanilla (thanks to 18 months oak aging). There is an earthy spine of minerality, adding to the concentrated and age-worthy texture. 90. Road 13 Vineyards is one of the wineries threatened this week by the Testalinden Creek forest fire. For the accounts I have read and heard, the fire – fanned by high winds – went very rapidly from a glow on the mountain side to a terrifying and fast-moving blaze last Friday night. Road 13 posted a tweet to friends and firefighters who helped protect the winery. “We are very grateful to everyone who helped keep the fire away from us and our neighbours last night,” the winery wrote on Saturday morning. Church & State Winery, which has a processing facility nearby on Highway 97, recounted the hair-raising night in a series of terrifying tweets. The news in the morning was that Church & State had survived. While some structures were lost, it sounds like most, if not all, Golden Mile wineries, including Road 13, escaped with a near miss. The fire is still burning as this is posted and the wind has come back up. The wineries are not out of danger yet. One certainly hopes for the best. By coincidence, I was monitoring fire news while tasting Road 13’s current releases. These are outstanding wines and most are available only at the winery. It would be tragic if such quality went up in smoke. It is worth noting that the three whites reviewed here are made entirely with Similkameen grapes. There also is Similkameen fruit in several of the reds. J-M Bouchard, Road 13’s winemaker, has become quite enamoured with the quality of the grapes he gets from the Similkameen. Road 13 Roussanne 2013 ($24 for 55 cases). This has six per cent Viognier in the blend. It is a big ripe Rhone varietal with 14.6% alcohol. The wine has a lovely golden hue perfectly in harmony with the almost sweet honeyed aromas of ripe apricots. There is intense fruit on the palate – rich flavours of ripe apricot and pear with a squeeze of lime. 91. Road 13 Marsanne 2013 ($24 for 114 cases). The wine begins with a delicate aroma of fresh melons, flowers and clover honey. On the palate, there are flavours of cantaloupe and pear, with a hint of that honey on the dry finish. A very interesting white. 92. Road 13 Viognier 2013 ($24 for 142 cases). This wine has classic aromas of white peach and vanilla, with flavours of peach and apricot. The texture is fleshy. There is a bit of warmth (but not unacceptable) from the 13.9% alcohol. That goes with the territory; Viognier needs to be ripe to have optimal flavours. 91. Road 13 GSM 2013 ($35 for 140 cases). This is 81.4% Grenache, 15.4% Syrah, 2.7% Mourvedre and 0.5% Viognier. The wine was aged 15 months in older French oak. It begins with aromas of pepper and spice with plum and black cherry. Generous on the palate, it delivers flavours of black cherry, plum, vanilla and pepper. The finish is very long. 91. Road 13 Syrah Malbec 2013 ($26.99 for 393 cases). This is 83% Syrah, 12% Malbec, 4% Viognier and 1% Mourvedre. The wine is quite dark in colour. On the nose, there are aromas of blackberry, vanilla and pepper which are echoed in the flavours, along with notes of mulberry. The texture is concentrated, making for a long finish and for good ageability. 92. Road 13 Jackpot Petit Verdot 2012 ($75; production 208 six-packs). Typical of this variety, the colour is almost black. An acquaintance of mine recently said, you can safely look at the sun through a glass of Petit Verdot (there is 4% Merlot in this). The dramatic aromas include black currant, mulberry, olive tapenade and graphite. This is an intense wine, rich on the palate with 15% of alcohol (but it is not hot). There are flavours of black currants, black olives, tobacco and chocolate. 94. A recently tasted bottle of 2007 Maréchal Foch from Starling Lane Winery, which was discovered in my cellar during a reorganization, was a reminder of how good that boutique Saanich winery was. Who expected such longevity from the variety? Yet the fruit was still fresh and the wine had not begin to fade. The bad news is that Starling Lane closed three years ago. The good news is that the Cowichan Valley vineyard that grew some of that Maréchal Foch is now owned by Mike and Robin Nierychlo. In May, they opened Emandare Vineyard not far north of Duncan. They have not yet released their Maréchal Foch but the barrel sample of that wine is promising, as is a barrel sample of Pinot Noir. They have released two excellent whites, one of them from the oldest block (14 years) of Sauvignon Blanc on Vancouver Island. It causes one to ask why Sauvignon Blanc has not been planted all over the island. As Mike points out, if that variety thrives in the cool climate of the south island in New Zealand, it should do equally well on Vancouver Island. To the best of my knowledge, the only other producer on the island with Sauvignon Blanc is Dosman Vineyards, a neighbour of Emandare. His planting is four years old. The Nierychlo name should be familiar to those who have followed wines in British Columbia. For several years, Mike posted wine videos on a site that was known as Wine Garage TV … until a California wine retailer with the similar name forced him to change the name. The site is still there, with almost 200 videos. Look for www.mnonline.ca. Mike’s wine education was almost entirely gained when he was picking the brains of winemakers and making contacts while producing the videos. He has combined that knowledge with his native shrewdness to develop Emandare, with the help of his wife, Robin. The winery name is the phonetic echo of their initials: M & R.
Both grew up in Langley, Mike, the son of Polish immigrants, in 1983 and Robin, the daughter of Dutch immigrants, in 1984. Soon after marrying Robin in 2004, Mike discovered that he and his brother-in-law shared a passion for wine. That led them to start making wines. They began with a cherry wine before progressing to grape wines. Robin says they never made the same wine twice. The next step in his wine infatuation was to start making videos. Their property, with about 6 ½ acres of vines, was planted 14 years ago by a grower named Marcel Fleurie. About the time that Starling Lane closed, Marcel – for personal reasons – leased the property to another winery, hung out a for-sale sign and moved away. It had been on the market for two years before Mike and Robin bought it in September 2013. The varieties grown here include two acres of Pinot Noir and one acre of Sauvignon Blanc; they plan to double that planting. They are also growing Siegerrebe, Gewürztraminer, Maréchal Foch and a combined acre of two Blattner hybrids, Cabernet Foch and Cabernet Libre. He is not impressed with Cabernet Libre and likely will pull it out after this vintage – although in 2014, it was the backbone of a popular rosé, 55% of a blend with Tempranillo, Malbec and Carmenère. Mike is not sure why the previous owner had planted about 100 vines each of three late ripening varieties more suited to Osoyoos than Vancouver Island. Another rosé is planned from the 2015 vintage. Although there are no current plans to seek organic certification, Mike and Robin have adopted many organic practices. They turned off the irrigation system completely. “Last year, 2014, was considered a drought year and our plants were healthy and happy,” Mike says. He believes the vines learned to fend for themselves because irrigation was sporadic when the vineyard was operated under lease. Last fall, they harvested 11 tons of grapes from a vineyard they were still rejuvenating. Friends helped Mike and Robin build the modest winery. And he dipped into his “Rolodex of contacts” to equip Emandare. In Emandare’s first vintage, 2014, the winery made about 800 cases of wine – two whites, a sold-out rosé and two reds still in barrel. The winery’s tasting room opened in May. Emandare also has been a regular attendee at the Duncan Farmers’ Market every Saturday. This has proved one of the best outlets for introducing the brand to the market. Here are notes on the two whites. Emandare Siegerrebe Gewürztraminer 2014 ($20). This wine begins with aromas of citrus and delivers generous and intense tropical fruit (lemon, guava). Low in alcohol at 10.4%, the wine is refreshing. The blend is 80% Siegerrebe, 20% Gewürztraminer. 89. Emandare Sauvignon Blanc 2014 ($24). The wine has a fleshy texture because a touch of residual sweetness remains. Herbal on the nose, the wine has flavours of grapefruit, kiwi and honeydew melon. 90. It is axiomatic that wine is best enjoyed in the company of other wine lovers. Recently, a neighbour provided that opportunity. He asked if I could lead a tasting for his house guests, knowing that I am always reviewing wine samples from British Columbia wineries. I don’t want to suggest he was being cheap. He was just being realistic. Like many wine reviewers, I appreciate neighbours who pitch in to finish the wines. I cannot drink them all by myself and, these days, most of the wines are too good to dump. His guests, all of them wine lovers, included a staff member of the Metropolitan Opera and a young couple who live in Santiago in Chile. They were intensely curious about British Columbia wine which they never get to taste. By good fortune, I had samples from Moon Curser Vineyards, which was opened in 2006 by Beata and Chris Tolley. Having planted varieties different from the Okanagan mainstream, they produce some of the most interesting wines in the Okanagan. The South Americans had some familiarity with Malbec and Carmenère. Many of the other varietals were novel to my tasting companions. I did not take all of the wines below to the neighbourhood tasting; it would have made for a very long (if pleasant) night. But we shared six. The guests went away with a positive appreciation of British Columbian wines. The favourite wine of the evening was Moon Curser’s Tempranillo, a red made with a Spanish varietal gaining traction in the Okanagan. Moon Curser Arneis 2014 Contraband Series ($25.90 for 318 cases). Moon Curser is the first Okanagan winery to release Arneis, a white varietal from Piedmont in Northern Italy. Apparently, the name of the grape in the local dialect means “little rascal.” That may have something to do with viticulture but certainly not with the quality of the wines. The wine is crisp and fresh with aromas of pear, honeydew melon and citrus. There is a delicate note of fennel on the dry finish. 91. Moon Curser Afraid of the Dark 2014 ($21.90 for 620 cases). This is 43% Roussanne, 43% Viognier and 14% Marsanne. It is a rich and satisfying white wine, with aromas and flavours of apricot, nectarine and hazelnut. 90. Moon Curser Border Vines 2012 ($26.90 for 1,328 cases). This is a blend of 37% Merlot, 22% Cabernet Sauvignon, 16% Petit Verdot, 15% Malbec and 10% Carmenère. The wine is deep purple in colour, with aromas of black currant, mulberry and blueberry. On the palate, there is black currant, blackberry and plum, nicely wrapped up with a peppery finish. The long ripe tannins give this a generous texture and a savoury finish with classic Okanagan sage notes. 92. Moon Curser Carmenère 2013 ($42.90 for 315 cases). Dark in colour, the medium-bodied wine has aromas and flavours of pepper; it also has flavours of cherry and black currant. The wine benefits from decanting to bring out its generous texture. 90. Moon Curser Malbec 2012 ($31.90 for 241 cases). This begins with the variety’s classic aromas of cherry, blueberry and violets. On the palate, the wine delivers bright fruit with flavours of boysenberry, blackberry and black cherry and with spice on the finish. 91. Moon Curser Petit Verdot 2012 ($31.90 for 247 cases). In the glass, this wine is so dark that – as one of our tasters said – you could look at the sun through it. You might want to lay in a bottle for the next eclipse. It is a muscular wine with bold, ripe tannins and flavours of cola, black cherry and coffee. The wine also has a firm backbone of minerality (a hint of graphite). This wine will age very well. 92. Moon Curser Pinot Noir 2012 ($24.90 for 97 cases). Dark in colour, this wine begins aromas of plums and dark red fruit. There are robust flavours of pepper and plum with an earthy undertone. As Okanagan Pinot Noirs go, this wine is a stylistic outlier that I would pair with game. That is not to criticise the wine: I take my hat off to the winery for daring to be different. 89. Moon Curser Tempranillo 2013 Contraband Series ($31.90 for 268 cases). This dark red begins with appealing aromas of plums, blackberries and mulberries. Those fruits are echoed in the flavours, along with coffee and dark chocolate. The wine is full-bodied and has a long, spicy finish. 93. Moon Curser Touriga Nacional 2012 ($49.90 for 48 cases). This is a rare example of an Okanagan wine made with the great Portuguese red. The wine also has a singularly dark colour. The aroma shows plum, black cherry, spice and cedar. Firm in structure, the wine has earthy flavours of plum, black cherry, dark chocolate and coffee. Decant this wine if you drink it now; otherwise, put it in the cellar and forget about it for five years. 92. Moon Curser Syrah 2012 ($26.90 for 1,299 cases). This wine is rustic in a positive way, with gamy, meaty aromas. On the palate, the flavours include plum, prune, deli meats, with liquorice, minerals and pepper on the finish. 90. Moon Curser Contraband Syrah 2012 ($31.90 for 444 cases). This is the more concentrated of the winery’s two Syrah wines, in part because some juice is bled off for rosé before fermentation. The wine has the classic black pepper on the nose and palate of south Okanagan Syrah, along with aromas of black cherry. On the palate, it has flavours of black cherry, liquorice, chocolate and leather. The wine benefits from being decanted. 91. Moon Curser Dead of Night 2012 ($42.90 for 247 cases). The winery’s flagship red, it is a blend of equal parts of Tannat and Syrah. Moon Curser was the first Okanagan winery to produce Tannat, an old French variety now better known as the backbone of Uruguay’s wines. While Moon Curser occasionally releases Tannat on its own, this blend is a match made in Heaven. The wine is rich, almost dense and chewy, with a medley of red fruit on the palate (cherry, plum, blackberry) set against a background of leather and coffee. 94. At a recent London tasting of British Columbia wines, the eminent British wine writer Jancis Robinson awarded 17 points to the 2013 Painted Rock Chardonnay. I am assuming she is scoring on a 20 point scale, in which case 17 points is a respectable score. You could try converting it to the 100 point scale by multiplying by five. In my view, that is never a satisfactory conversion. A score of 85 is an unenthusiastic rating from critics using the 100 point scale. The explanation is that the 100 point scale effectively is also a 20 point scale, with most scores clustered between 88 and 92. The only judges to award less than 80 points when using that scale tend to be judges from the ranks of amateur winemaking. Those judges usually have a broader range of quality to account for. There are 75 point commercial wines, of course, but most critics simply ignore them. Commercial wineries are expected to do better than that, and usually do. Having digressed on wine scoring, I wonder how many points Ms. Robinson would award to the 2014 Chardonnay from Painted Rock. It is a spectacular wine that could inspire a new catch phrase: Nothing but Chardonnay. The wine, bottled six weeks ago, is just being released in the winery’s Okanagan tasting room.. The winery puts considerable effort into making this wine. Here is my note on the wine. Painted Rock Chardonnay 2014 ($30.35). The wine has glorious aromas and flavours of tropical fruit, including peach, mango and passion fruit. The bright acidity accentuates the refreshing clarity of this fruit-focussed wine. The oak forms a subtle backdrop and supports the lush texture that emerges as the wine warms in the glass. The finish lingers and lingers. 93.